The Picture below demonstrates how to setup the route frequencies. B). In field B type the length of days for the first frequency, For example if you put Weekly in box A then the length of days in box B should be 7. C). If you need to setup a frequency like the first Monday of the month or the 2nd Thursday, click the round button under “Use Interval Settings” labeled C. Then you would use the fields Month Frequency, Interval Frequency and Interval Day to complete the first frequency. D). 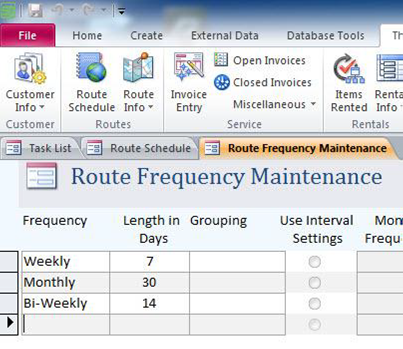 Click this button if you want it to be the default frequency when setting up your routes. E). 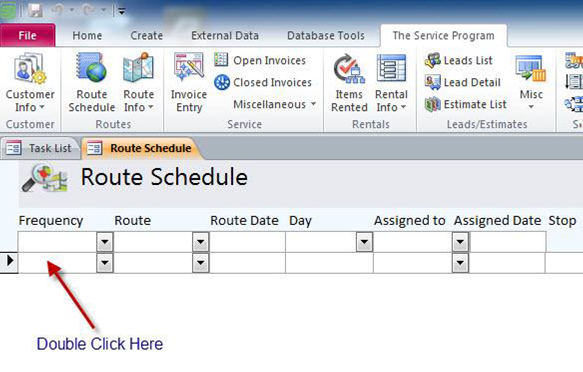 Click this button if after posting your routes at the end of the week you want the route stop to be deleted from the route schedule. This is useful when creating a “One-Time” route frequency. Below shows an example of a correctly filled out Frequency Maint. Window. Close the Frequency Maint. Window so you are not back to the route schedule. We should now see the different frequencies we setup in the frequency drop down, if not just close and reopen the page to refresh it.